Great for home, RV, cabin or glamping – glamourous camping. Click photo to watch YouTube Video. 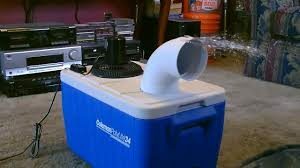 Description: Homemade AC Air Cooling unit produces very cold air: 42F in an 80F room. This entry was posted in NewsBlog and tagged DIY Solar Projects, fun and useful solar projects on July 22, 2018 by Helen Deffenbacher.